Yesterday I spoke my mind about Sleepwalking into the future. I put my all into it. I picked my words carefully, and I let it rip. It is something that blog writers and podcasters often do, sometimes to their detriment. Well maybe not that dramatic, as the post only received one comment, so I shouldn’t really form an opinion based on that alone. However, the stats speak for themselves. It was not the most popular post or podcast that I have recorded or written. I just needed to get it off my chest. I know that the podcast episode was a bit of a downer, I’ll be the first to admit it. 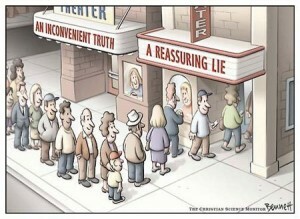 Some would rather have the reassuring lie than the inconvenient truth. And that is what I did. I am okay with that. Life is not a popularity contest. In the scheme of things, this blog is not that popular. However, I do know this about this blog, and all its readers. We are a caring community and we are only human. We care about our environment, we care about humanity. It is the sharing makes us human. It is the caring makes us human. Telling it how it is makes us human. If anything will get us through the next few decades, it will be the caring side of humanity that does it. Friendship and mateship. Looking out for one’s fellow-man and woman. I for one love being part of this community. It is one of the reasons I get out of bed in the morning. That is what gives me hope. That is why I have faith in humanity, and that we can turn this train wreck around. When all looks lost and when it looks like governments and corporations don’t give a damn and are just in it for themselves, don’t give up. Never give up. Fight the good fight, and remember that we are all in this together. And, thanks to the democracy we live in, we all have one vote each. It is our voice. Don’t waste it whenever you get the chance to flex your voting muscle. It is far too precious to give away to those who don’t care. There you go. I said it. Kale. Once totally foreign to me, it is a very welcome vegetable in our food garden. We have tonnes of it because Kim insisted that I plant some more seedlings after the others had grown very large. I did what I was told of course 🙂 and put in another six Kale seedlings. 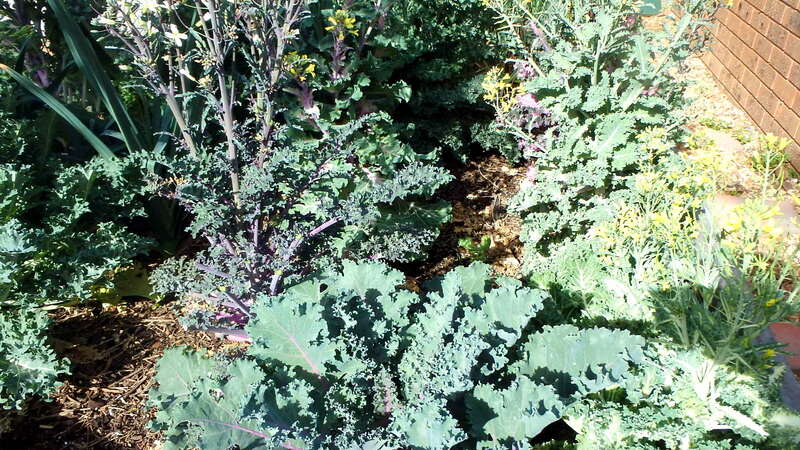 We have at least a dozen very large Kale bushes in the front garden bed right now. In fact, we have so much of the stuff, we are scouring the net for recipes to use it all up. Kim picked a bowl of flower heads yesterday to cook as sprouting broccoli, and a swag of leaves for dinner. 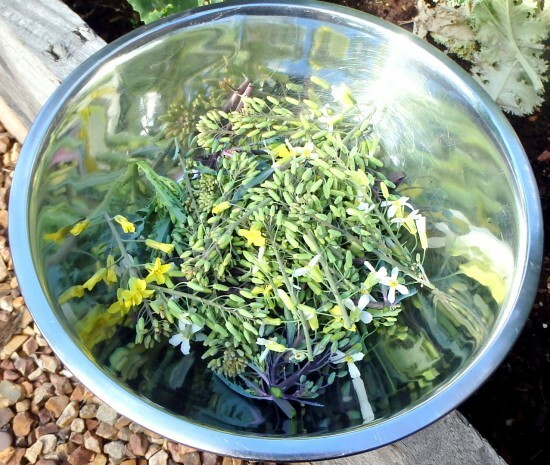 We steam these flower heads. They are simply delicious, and so glad that we tried them, because the sprouting broccoli went to seed about four weeks ago. Not only do we love it, Kim said she had to fight off the swarm of bees just to get at them. They love the flowers too. The leaves are so colourful, from whites, purples, light green, to dark greens, the leaves are all of various shapes, some obviously thicker in texture than others. We strip out the tough centre vein and just used the leaves shredded in most meals. So what was for dinner. Well, Kim cooked up Spicy Kale and Garlic Spaghetti. It was delicious, nutritious, and full of flavour. I’m talking amazing flavour. I will share a few more Kale recipes this week. Tomorrow night I am cooking Bean soup with Kale and rustic garlic bread. We are looking forward to that one, however I think I will spice it up a bit and modify the recipe that I found. If it turns out okay, I will post it on the blog. We like Kale so much that we will definitely plant these cultivars again next year. Even though the punnet of seedlings were labeled as ornamentals, there is no reason why you cannot eat this amazing Brassica. We certainly have, and will be for the next few weeks. These colourful varieties are only a few of the many different types of kale that you can grow. The great thing about Kale is that when it goes to seed, it is still very edible. The leaves don’t toughen like broccoli or cabbages do, or goes woody like cauliflower. It is just a great all-rounder. 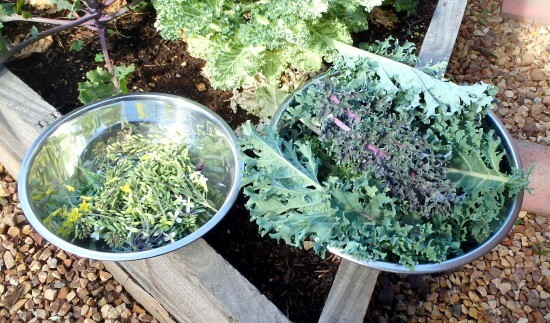 So do yourself a favour, and get some kale in the ground when you have your cooler season. Super food or not, it is a great vegetable to have in your food garden. Oh, and the Kale chips are to die for. We can’t get enough of those either! Who else planted and ate Kale this season. Was it your first time, and what amazing meals did you use it in?